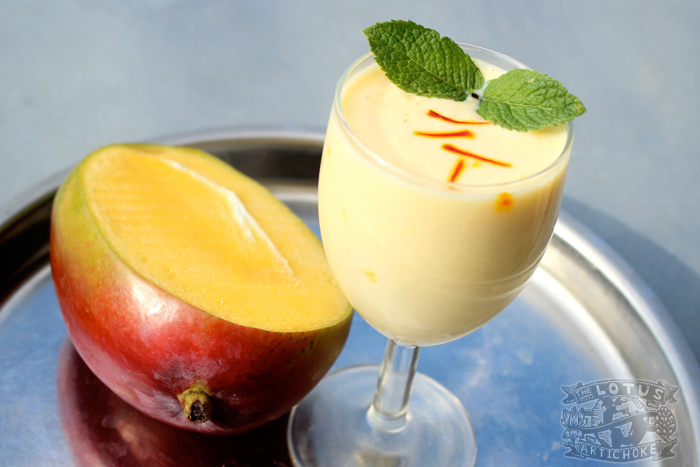 Of course, you can make lassi without saffron and increase the mango if you want a more intense fruit flavor. I personally love the taste of saffron and the hint of rose. Feel free to experiment and come up with your best lassi. If you’re really feeling adventurous: try out some of the savoury variations I’ve listed below. Boil 1/4 cup water and transfer to small bowl. Soak saffron threads in water for 30 min. In small food processor or blender, blend soy yogurt, mango, ice cubes, sugar, rose water, cardamom. Add saffron + water (or just water) and continue to blend until smooth. Add slightly more water if necessary to get desired consistency. For best results, chill for one hour. Serve in two chilled glasses with fresh mint for garnish. No saffron in the house: Skip steps 1+2, use cold water for step 4. No rose water or cardamom: admittedly, not for everyone. Simply omit. Savory Indian vegan lassi: Skip steps 1+2. Omit mango, sugar, rose water. Use cold water and plain yogurt. Add a pinch of salt and a pinch of fresh ground cumin. Garnish with a splash of tamarind mixed with agave or maple syrup. This entry was posted in Indian and tagged Indian, Jaipur, lassi, mango, recipe, saffron, vegan. Bookmark the permalink. Yumm! I’m not a great fan of soy products, because they seem so processed to me, but this lassi I would drink at any moment! This recipe looks great.I make my own coconut yogurt, so I am going to try it with that instead of soy. I use kefir starter to make the coconut yogurt. It is so good. I use it when I make cucumber raita and with anything that calls for yogurt. =Great in smoothies as well.